What does everyone feel about doing an exchange nailing after 4-5 months of external fixation of a tibia fracture for delayed healing. With or without a pre-existing pin tract infection. Do you do it and if so what is your protocol? I thought "exchange nailing" meant there was a nail already there to be exchanged. I'd be very reticent to nail a tibia after 4-5 months in an ex fix. Pin sites are pretty well contaminated by then, with or without a "pre-existing pin tract infection." This scenario can be avoided by not using an external fixator for a tibia fx (unless it is not nailable), or by switching to a nail early on. Routine, pre-emptive bone grafting once the soft tissue envelope permits helps ensure timely healing if external fixation is chosen as definitive management. Nonunion after external fixation is generally safer to fix with a plate (or better fixator?) than with an IM nail, even though there is probably a role for nailing in some selected late salvages. Two articles I know of have some good info. My thoughts are if the patients have had clean pin sites and few other risk factors, it is a reasonable thing to do. It is unclear to me how long if any cooling off is needed or thew role of antibiotics. I have exchanged acutely w/ pin tract curretage and periop antibiotics. I agree with Peter. Early bone grafting of externally fixed fractures has been shown to reduce the incidence of nonunion and late malunion. If the fixator has been on for months, I would think about a plate. Occasionally with an Ilizarov, there are areas or regenerate that won't mature, or a metadiaphyseal nonunion that just won't heal. The fixator has been on for months...and you want to try another method. Though nailing has been described, my preference is to remove the fixator, agressively debride the pin sites, treat the patient with antibiotics and let the skin heal. When the skin is healed and pristine (3-4 weeks), and if there is no evidence of ring sequestrum etc, I proceed with reconstruction. My preference is plating...the canal isn't seeded up and down, and any pin sites in the field can be debrided openly. I have never done this, either with or without pin tract infection. If I had to do so, I would stage the procedure and cast the tibia fx for a period of time. Arlington Orthopedics and Hand Surgery Specialists, Ltd.
See previous discussion of IM nailing s/p ex-fix and paper by Rubel et al OTA 2001. Some colleagues in the discussion pointed to unacceptable infection rate after ex-fix to nail conversion. A question about nail design (solid/hollow) and techique (reamed/unreamed) in the complicated cases still left unanswered. And a case to continue the discussion. A male 31 y.o. referred to us from elsewhere after 7.5 months of external fixation after a buck-shot femoral fracture (see attachment). At the moment ther is no sign of infection either pin tract or wound. Knee ROM is 20 degrees. Walks with one cane. We think about conversion to a closed interlocked nail. I'd like to hear opinions of the group. Plating after ex-fix has a well established track record, with low risk of infection. It's my procedure of choice following prolonged ex-fix. Remove the ex-fix, wait approx 4 weeks, come back and plate. (Re case presented by Dr. Chelnokov) Plate + bone graft after the pin sites are healed. >Some colleagues in the discussion pointed to unacceptable infection rate after ex-fix to nail conversion. A question about nail design (solid/hollow) and techique (reamed/unreamed) in the complicated cases still left unanswered. I agree that your question (i.e. will unreamed im nails reduce the risk of infection after ex-fix to im nail conversion ?) should be answered. A cursory search of Medline and the OTA abstracts using the terms "unreamed"+"intramedullary"+"nail"+"external"+"fixation" found no reports of ex-fix to unreamed im nail conversion. Although, as you have graphically shown - unreamed nails have lost favor because of fatigue limitations - *perhaps* there is a role for them as a *temporary* measure after ex-fix removal during the infection-prone interval of 4-6 weeks after ex-fix removal as described by Drs. Watson and Kuldjanov. This might obviate the need for the otherwise recommended casting or prolonged traction (which can be difficult to arrange in any country these days). After two months, an exchange nailing (as defined by Dr. Trafton) would replace the unreamed nail with a larger diameter, reamed nail in anticipation of a course of prolonged fracture healing. 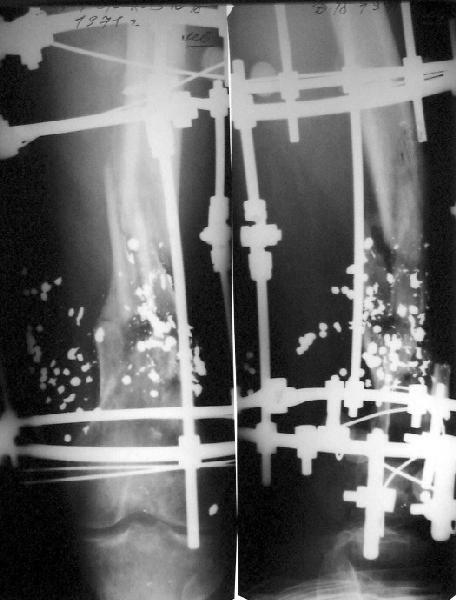 In addition, if the unreamed nail is hollow, a possibility may exist to thread a string of narrow diameter antibiotic beads down its lumen as another protective measure (used by the arthroplasty surgeons in their infected exchanges). Given the extensive use of external fixation in your part of the world and your experience with and access to unreamed nails, it seems you are in the ideal position to answer your own question. (It looks like you have already collected 5 cases). I don't think it matters whether the nail is solid or hollow nor does reaming increase the infection risk. I think that was the opinion of most responders when we discussed this question previously. BB> "unreamed"+"intramedullary"+"nail"+"external"+"fixation" found no reports of ex-fix to unreamed im nail conversion. Looks very strange. Neither reamed but solid? The particular headache was made by my own hands - the stressed zone due to the hole located close the fracture level was additionally weakened by drilling to 6 mm in the 11 mm nail. Routinely perform two staged nailings is too expensive in all meanings. So it seems to me that solid nail of larger diameter with minimal reaming can be more safe and reliable definitive measure. If of course risk of infection is really lower than with hollow nails with conventional reaming. BB> Given the extensive use of external fixation in your part of the world and your experience with and access to unreamed nails, it seems you are in the ideal position to answer your own question. :-)) Maybe. But results would be more relevant with two groups for both types of nails. And with randomized controlled trial. BB> (It looks like you have already collected 5 cases). Totally 12 for all long bones. I think the article by Gustilo and others showing a high rate of infection with nailing after XF has prompted most people to pursue other treatments. However, the other treatments are often inferior to nailing. Many patients have done well with IM nail after XF. I have used a two stage approach to IM nailing after XF. The first stage is debridement of the pin tracks, reaming the medullary canal, biopsy for culture from the nonunion site and any other suspicious areas, and placement of antibiotic beads. The second stage nail placement is done after cultures are no growth. TAC> I don't think it matters whether the nail is solid or hollow nor does reaming increase the infection risk. At least in few cases of acute conversion of XF 3 and more months old we met not one case of infection with solid nails. Maybe the series is too small though. And next 5-7 patients will show the same approx 80% of infection as colleagues reported. TAC> I think that was the opinion of most responders when we discussed this question previously. I'd be happy to learn more about either published or unpublished comparative series. I'd estimate the risk of infection after IM nailing after XF at about 20% (80% is a worst case scenario); but even that may be "unacceptably high" and therefore rationale for a two stage nailing routine. I routinely do an exfix for dirty wounds prior to nailing and receive a number of referrals that had or have an ex fix. In eight years I've had one infection and I don't think I can blame it on the exfix. The caveat to this is if they've had a pin tract infection or a lot of drainage I will not rod them. The infection rate for IM nailing s/p ex-fix was estimated at 80% in Chelnokov message. I, like Kyle, think the infection rate is MUCH less (2-20%). TAC> The infection rate for IM nailing s/p ex-fix was estimated at 80% in Chelnokov message. TAC> I, like Kyle, think the infection rate is MUCH less (2-20%). I met no one to date. Plating is a great way to treat long bone shaft problems after long term ex-fix. Use classic compression technique, and use the tensioner device. I love nails, but hate infections.